Albuquerque Academy is pleased to partner with SAGE Dining Services again for the 2018-2019 school year. SAGE, founded in 1990, is the leading food service provider for independent schools and colleges throughout North America. SAGE focuses on safety, quality service, community, nutrition, education, sustainability, and delicious food made from scratch using seasonal, locally-sourced ingredients. On-site Chefs will get to know our school community and tailor the menu according to our preferences. We will enjoy improved variety and quality of food, along with enhanced presentation and improved service. Each day, SAGE will offer fresh-made menu items, including a salad and deli bar with house-made dressings and hummus, fresh ingredients sourced from local vendors, and in-house roasted beef, turkey, and chicken; a healthy main dish with a variety of starches and fresh vegetables as sides; creative, food truck-style fare; authentic Latin and Asian dishes; expanded vegetarian options; and even display cooking and themed do-it-yourself stations. In order to keep all students safe in the dining hall, SAGE provides expertise on allergy accommodations and ADA (Americans with Disabilities Act) compliance. With one out of every 12 SAGE students managing a food allergy, SAGE takes great care to ensure that all SAGE Team Members are extensively trained in food allergy awareness, that the menus provide enough variety so there is something for everyone, and that community members are well-informed through complete ingredient lists and serving line signs. SAGE’s comprehensive allergen filter, which can be accessed through the online menu, makes planning meals easy. Parents are always welcome to visit the kitchen and ask about inventories and preparation methods. SAGE also extends education into the dining hall by guiding community members towards healthy food options. We can make informed decisions about what to eat using SAGE’s Spotlight Program®, a color-coded system that shows the nutritional value of each item offered. In addition, we will learn about historical, cultural, and culinary topics related to food each month through their Educational Seasonings program. Through informational guides, creative displays, taste-testing, and hands-on preparation, SAGE will present a variety of topics this academic year, including: Thanksgiving in the Wild West, Oatmeal Mania, Ancient Grains, and Hawaiian Cuisine. 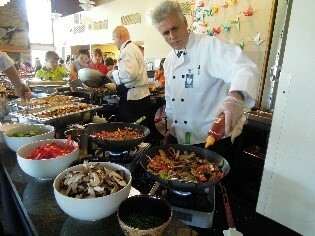 For more details about what SAGE has to offer, please visit www.sagedining.com. Keep an eye out for the new menu in August!